Enjoy a wide variety of articles, cartoons, and other postings designed just for you, cat lover! Sign up to get our new blog posts delivered right to your inbox! http://carlisletheacarlisletheatre.org/wp-login.php Lynn Baer, DVM, Cat Specialist, shares her top tips for cat owners to ensure well adjusted, happy cats. Lynn says, “happy cats are healthy cats and happy cats make owners happier and healthier, too”. Tip #1) Recognize the fact that indoor only cats have no choices of their own in life. They are completely reliant on what we offer them. We choose their litter box size, shape, location and litter substrate. We choose where they are fed, what they are fed out of, and what foods they are offered. We choose their toys, their beds, their bowls, and everything within their lives. Cats have few choices of their own. They would be happier given more choices of their own and once owners understand that and begin to expand their options, cats would remain healthier and happier. Cats are held captive within four walls for their entire lives. Open the blinds, open the windows, grow grass, bring leaves and branches in for them to smell. Again for owners to be more aware of the fact that their cats have never walked on grass or soil, experienced changes in temperature, smelled different smells, or had the ability to walk around the block to explore new surroundings. Owners should evaluate every opportunity to enhance their indoors cat’s lives by bringing new things into the home. Build catios, window units or other alternative opportunities for cats to experience the outdoors. At a minimum place window seats around the house (off the ground), build vertical spaces for them to climb, train them to walk on leashes, erect cat proof fences, etc. Indoor cats are bored, depressed and inactive. Owners don’t generally play with their cats daily. Cats need exercise, mental stimulation and fun. Having a basket of toys for cats is not enough. Owners should actively engage with their pets by using wand toys, laser lights, throwing blankets over furniture to create tents, rotating toys daily. Adding silvervine, catnip, and valerian to their arsenal of toys will give cats new experiences. Using foraging toys for food rewards, making cats hunt for some of their food all help to stimulate their body and mind. Tip #4) Lots of scratch posts – both vertical and horizontal for cats to scratch on. I am completely opposed to declawing (having never performed one in my entire career). Scratching is a form of communication and also gives cats the ability to stretch their muscles. It is important they have great areas and substrates to scratch on. It makes them happy. Don’t allow a veterinarian who declaws to treat your cat. Take your cat to a vet at least once a year for a good physical exam and blood work. Cats are notorious for hiding pain and illness and if an owner thinks their cat is sick, they are likely very sick. Pay attention to any changes (no matter how small) and seek veterinary care immediately. Age is not a disease and many owners ignore signs of illness as due to advanced aging. That is not in a cat’s best interest. Owners need to advocate on behalf of their pets and insure good medical care. Seek second opinions. Good veterinarians encourage owners to do so and are never offended by it. Wet food is lower in calories and higher in protein and moisture. It is extremely important to feed cats at least 5-6 times daily. Don’t feed one brand or diet only. Variety is the spice of life and cats are used to eating birds, squirrels, rats, mice, chipmunks, bugs, etc. One diet or one brand is not normal. Either is feeding once or twice a day. Editors Note: Find many of the toys, scratchers, outdoor enclosures and cat furniture mentioned in this article right here. A small, white kitten camouflaged by freshly fallen snow, was discovered frozen by the Bingham children playing outdoors. 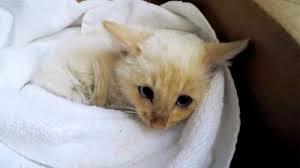 The seemingly lifeless kitten was rushed inside their house. A quick thinking father called his vet trained brother, Justin, who rushed to the scene and started to work on the motionless kitten. After Justin dedicated an hour of rubbing the kitten and pumping his chest in an effort to get his blood flowing (see video at: Lazarus Kitty ), the miracle baby started to revive. By the end of the day, the little guy was up on his paws and meowing. The family named him Lazarus, after the Bible story of Lazarus, whom Jesus raised from the dead. Lazarus was adopted into the family, and is now romping energetically around their home. What types of environmental enhancements do you offer your cat? Caring for cats properly involves much more than simply furnishing food, water and a litter box. Environmental enrichment, such as toys, food puzzles, perches, and even hiding places, can really change the quality of life for almost any cat. Certainly, in shelter cats, this is an important study. It underlines the need for more than just basic care in the lives of these animals and the fact that this enrichment is easily achievable. After all, the ultimate goal is to give these cats the best chance for adoption. Cats that are comfortable in their environment and confident will show it in their behavior. And confident behavior is much more “adoptable” than a cat that is hiding in his cage or, worse yet, acting in aggressive manner out of fear. However, this study also can be extended to those of us who keep multi-cat households. I have three cats and frequently see two or more of my cats interacting with the toys and puzzles at once. In fact, it seems as though if one cat shows interest, it generates interest in the other cats as well. 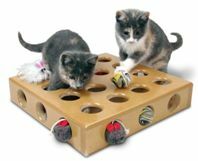 Many environmental enhancement toys, cat furniture and other items can be found at www.MyThreeCats.com, the experts in optimum care care and well being.